What's better than having a pet dragon at your side? How about dozens or even hundreds at your beck and call? It may sound like overkill, but that's what you should get ready for in Dragon City. As an expert dragon breeder, it's going to be your sworn duty to handle all things related to these mythic beasts. Build a suitable environment for them. Feed and rear them so that they can grow big and strong. Train them into lean mean fighting machines and see how much of a fight they can put up. If you can keep it up and prove your prowess, then you might earn the honorary title of Dragon Master from your peers. There are never enough dragons, especially in Dragon City. You got big dragons, small dragons, mean dragons, cute dragons, land dragons, flying dragons, and so on. Getting them all is going to take a lot of hard work, but the results are more than worth it. Raise over 100 colorful and well-animated dragons. Feed your dragons to increase their levels. Better food gives them more experience, and higher level dragons generate more gold. Watch your dragons grow from adorable little hatchlings to powerful adults. Purchase new eggs from the Hatchery. 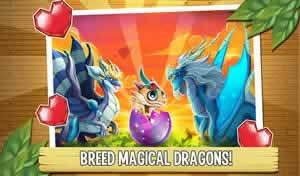 Breed dragons of different species together to produce unique beasts that can't be acquired through any other means. This isn't called Dragon City for nothing. Your dragons need a home, and you need a place to work. With the right buildings and establishments, you'll be well-prepared to deal with any issue that arises when it comes to the care and feeding of these magnificent beasts. Set up a variety of habitats for different types of dragons. Habitats include the desert-like Terra Habitat, the volcanic Flame Habitat, the oceanic Sea Habitat, and more. Grow food for your dragons at your farms. Build Dragon Markets to produce extra gold and food automatically. Store dragon hatchlings you have no room for at the Kindergarten. Purchase new plots of land to increase the amount of space you can build upon. Visit other people's worlds. Marvel at the cities they've built and the dragons they've bred. It's not enough to just watch your dragons grow up and be majestic. You're going to want to see them fight as well. Dragon City includes a robust combat system that allows you to challenge monsters controlled by either the computer or another player. Train your dragons at the Training Center. Help them learn powerful elemental attacks like Acid Rain, Black Hole, and so on. Engage in thrilling turn-based fights. Watch dragons unleash their most devastating attacks on each other. 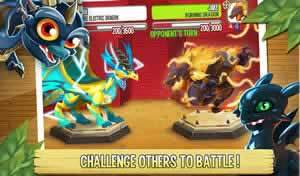 Join the PvP leagues and pit your three best dragons against players all over the world. Earn gems from your victories. Watch your pets advance in rank. Higher ranks open the doors to more challenging and rewarding opportunities. 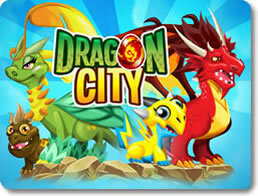 Dragon City is an excellent combination of the virtual pet and city-building genres. You've got plenty of leeway to build a dragon-breeding center in your image, and even more ways to raise your wyrms from babies to grown-ups. Most of all, the dragons are so positively gorgeous in their designs that you'll want to acquire all of them just to see how they look, move and fight. Set yourself on fire with Dragon City today!